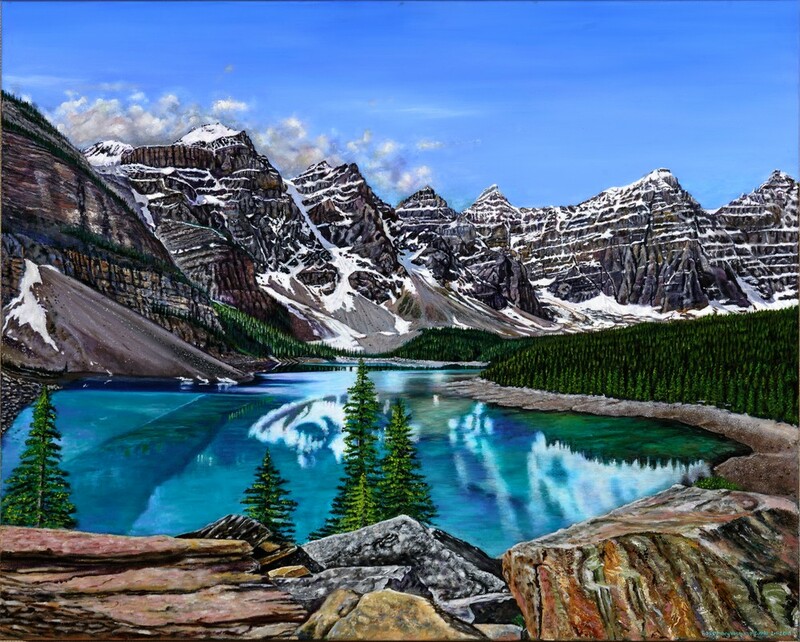 This 24" x 30" Moraine Lake painting is based on an image taken by Chad Tuthill of Zoetic Photography - San Diego. This 24" x 30" painting is based on an image taken by Chad Tuthill of Zoetic Photography - San Diego. Moraine Lake is 14 kilometres (8.7 miles) southeast of the hamlet of Lake Louise. Glacier-fed, the blue/emerald/turquoise color of the water (depending on which glacial lake it is) comes from "rock flour" that is suspended in the water, causing refraction of light. (Rock flour is very fine rock dust that has been ground up by the glaciers.) As mentioned, the angle at which you are viewing the lake can also make a difference in the apparent color of the water.